BOSTON, December 4, 2018 – Responding to a strong community need raised by local nonprofits, Eastern Bank, America’s oldest and largest mutual bank, has announced that the Eastern Bank Charitable Foundation is granting additional Partnership Grants as part of its 2018 charitable giving. As a result, a total of $500,000 will now be awarded to 20 nonprofit organizations by year-end to specifically address their capital needs. 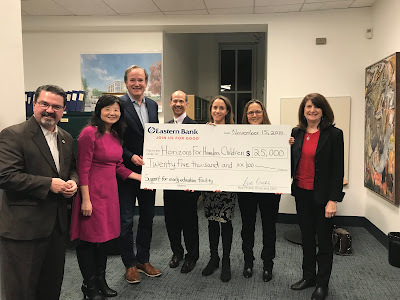 Eastern Bank’s Partnership Grants are awarded at $25,000 each to nonprofits in communities from New Hampshire to Rhode Island and throughout Cape Cod, MetroWest, Greater Boston and the North Shore, South Shore and Merrimack Valley. Earlier this year, ten other Partnership Grants were awarded to: Boston Rescue Mission (Boston); Community Health Center of Cape Cod (Mashpee); JOI Child Care Center (Lynn); Merrimack Valley Food Bank (Lowell); Mission Hill Neighborhood Housing Services (Mission Hill); Plummer Youth Promise (Salem); Raw Art Works (Lynn); Signature Healthcare (Brockton); The Way Home (Manchester, NH); and Toward Independent Living and Learning (Dedham). Since 1999, on average, Eastern Bank has given 10 percent of its net income—seven times the national average—to charity each year, which now totals over $110 million. The Eastern Bank Charitable Foundation has several different grantmaking programs set up to support the Bank’s culture rooted in community service and the pursuit of social justice and opportunity for all, with Partnership Grants specifically dedicated to funding nonprofit capital needs. Information about all of Eastern Bank’s grant-giving programs is available here.